The runaway of the title story is a young woman who, though she thinks she wants to, is incapable of leaving her husband. In “Passion,” a country girl emerging into the larger world via a job in a resort hotel discovers in a single moment of stunning insight the limits and lies of that mysterious emotion. Three stories are about a woman named Juliet–in the first, she escapes from teaching at a girls’ school into a wild and irresistible love match; in the second she returns with her child to the home of her parents, whose life and marriage she finally begins to examine; and in the last, her child, caught, she mistakenly thinks, in the grip of a religious cult, vanishes into an unexplained and profound silence. In the final story, “Powers,” a young woman with the ability to read the future sets off a chain of events that involves her husband-to-be and a friend in a lifelong pursuit of what such a gift really means, and who really has it. Throughout this compelling collection, Alice Munro’s understanding of the people about whom she writes makes them as vivid as our own neighbors. Here are the infinite betrayals and surprises of love–between men and women, between friends, between parents and children–that are the stuff of all our lives. It is Alice Munro’s special gift to make these stories as vivid and real as our own. "As with so many of Munro's stories, you read to have your premises altered and deepened. Could anything be better?" "In Alice Munro's hands, the smallest moments contain the central truths of a lifetime." “Munro’s new collection is again filled with small masterpieces illuminating real life... profound in important ways. 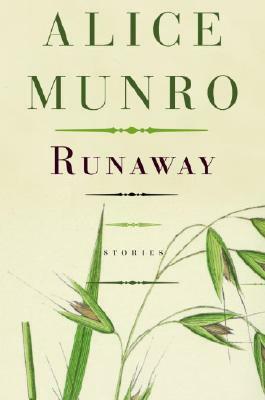 "Munro is wise in the ways of human emotion, and her stories are so rich…that even a tale of less than 50 pages feels as rounded as a novel." "Each of the stories in Runaway contains enough lived life to fill a typical novel, and reading them is to become immersed in the concerns and worlds of their various characters…Her women are heroic. They endure the lives produced by their choices and the fates, and they endure in the mind of the reader."